all plopped in a Haagen-Dazs carton. Oh, this is darling and creative as always! I always went to camp growing up, and these goodies would have been fun to take along! Great idea - just darling! 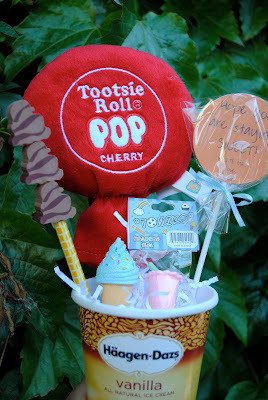 Campbell cant have any Candy or food sent this is just such a cute take off...loved the ideas! Did you figure out pp for the notecards? I am loving your blog!